The Orthodox and Eastern rite churches such as the Ukrainian have maintained the Julian Calendar for ecclesiastical purposes into this century. The Ukrainians, numbering some 50 million in the world are the second largest nation following the Julian Calendar in their churches. The difference between the two Calendars placed Christmas on January 7th and, because of the size of the Ukrainian church the date has become widely known as “Ukrainian Christmas.” However, there are other smaller Eastern-rite Orthodox national churches such as the Greek, Syrian, Serbian, Bulgarian and Byelorussian that follow the same calendar. Historically the Julian Calendar is sometimes called Old Style (O.S.) and the Gregorian is called New Style (N.S.). All the Orthodox countries which preserved the Julian Calendar into this century had a 13 day lag. Thus a date would be written January 4/17, 1918, meaning the 4th in new style and 17th in the old style calendar. Many Ukrainian families and many Ukrainian churches continue to observe the old traditional date of Ukrainian Christmas on January 7 despite the pressures of modern society to change. The later date appeals to many people since, after the commercialism of December 25th, it is possible to enjoy a quieter and more religious occasion. For those who leave their shopping for the last minute the big advantage in celebrating Ukrainian Christmas is that the big sales start – just in time for Christmas shopping. – A.G. Among the Ukrainians, the most beloved of all festivities is Christmas which covers a cycle of important fest days, centering around family and agricultural modes of life, is very colourful, being the most important part of Christmas. Its main feature is the evening meal called “Holy Supper” (Svyata Vechera) in literal translation. According to custom, all members of the family should be that night for a family reunion. The supper on Holy Night differs from other evening meals, having twelve Lenten dishes, symbolic of the twelve Apostles who gathered at the Last Supper. The dishes are prepared with a vegetable shortening or cooking oil, omitting all animal fat, milk and milk products because Christmas is preceded by a period of fast which ends on Christmas Day after midnight or morning church service. The day of the Christmas Eve is a strict fast in commemoration of the hardships endured by Mother Mary en route to Bethlehem. The table, set to according to time-honoured custom, is first strewn with a small handful of fine hay in memory of the Christ Child in a manger, and over it is spread the very best tablecloth adorned with native embroidery. 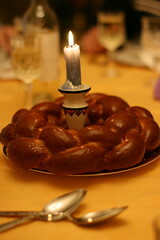 Bread (kalach), symbolizing prosperity, constitutes the central table decoration. Three round, braided loaves are placed one on top of the other with a candle inserted into the top load, and the bottom loaf encircled with tiny twigs of evergreen. Candles on both sides of the loaves complete the table decoration. If a member of the familhy has died during the year, a place is set for him in the believe that the spirit of the deceased unites with the family on that magic Holy Night. A lighted candle is always placed in the window as an invitation to any homeless stranger, or perchance a lost soul, to join the family in celebrating the birth of Christ. Prior to the evening meal a spoonful of each dish is mixed into the feed of the domestic animals, because animals were the first creatures to behold the new-born Christ. The first star in the eastern sky announces the time for the commencement of the meal. It is the children’s duty to watch for the star. Each member of the family, dressed in holiday attire, awaits the customary ritual opening. This is done by the master of the household who brings a sheaf of what called “did” or “didukh” (grandfather), a symbol of gathering of the clan, and greets his family with traditional salutations, expressing joy that God has favoured them with good health and general well-being. The sheaf is placed in the corner of the dining room, and remains there until New Year when it is taken out and burned. In the cities this tradition has been modified, and the sheaf is replaced with a few stalks of wheat which are placed in a vase, or they may be used as a table decoration. Members of the family and servants gather around the table. The meal begins with the Lord’s prayer and then a thanksgiving grace appropriate to the occasion. 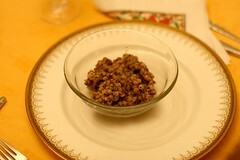 The first and indispensable dish is kutya, a preparation of cooked wheat dressed with honey, ground poppy seed, and sometimes chopped nuts. This ritual dish, of a very ancient origin, has survived hundreds of generations without losing its importance in the Christmas festivity. it starts the meal in a ceremonial manner. The head of the family raises the first spoonful of the kutya, invoking God’s grace, and greets the family with the traditional Christmas greet: “Khrystos Rodyvsya” (Christ is born), to which they all reply in unison: “Slavim Yoho!” (Let us glorify Him). Following this ritual everyone must partake of the kutya, if only but a spoonful. The exact meaning of kutya has been lost. However scholars of the folklore generally believe that originally it symbolized the spiritual clan unity of all living and deceased members. Agricultural prosperity may have been a secondary symbol. 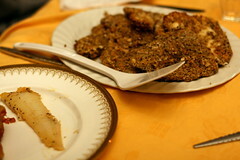 Kutya may be followed with an appetizer of pickled herrings or pickled mushrooms, or with a serving of borsch, after which comes one or more preparations of fish and various other traditional dishes, ending with a dessert of stewed dried fruit, or fruit varenyky, and the Christmas pastries and nuts. Everyone must have at least a small serving of each dish. After the solemn meal, the family joins in singing Christmas carols and general merry-making. There is no visiting on Christmas Eve with the exception of bringing Yuletide greetings and some of the supper dishes and pastries to the grandparents. It is strictly a family evening. There are many beliefs and superstitions connected with the Christmas Eve celebration which are no longer observed. Soon after midnight or at early dawn, the family attends a special Christmas service enriched with beautiful choral music. In the afternoon of the Christmas Day, continuing late into the night and through the following days, organized groups of carolers visit homes, singing ancient and modern carols, bringing traditional Yuletide greetings, and soliciting funds for worthly causes. Edit: Taras points out that the Holy Supper should really be transliterated as “Svyata Vecherya” (Свята Вечеря) as well as “Slavimo Yoho” (Славімо Його), but from what I’ve noticed they are commonly made mistakes here in North America. Happy Ukrainian Heritage Day Ontario! It’s very nice to celebrate Christmas in Ukraine. The food was great and the celebration seems really good. Hope I could visit there someday. How I wish I could go there. i do this here in Canada, i make it more family and close friends it works well for me. i just make sure i remind my work that it my Christmas day and they give me it off. Very nice post. How I wish I could go there. Kutya represents the blood of Christ. I don’t think that’s correct – that’s wine at communion. Please note: In North America many Eastern right churches (Ukrainian I speak of) have switched to the Gregorian Calendar but hold fast all the traditions of Ukrainian Christmas. We still celebrate “Ukrainian Christmas”, just on December 24th/25th. See St. Nicholas church in Chicago, IL; St.Demetrius Church Toronto, ON; Christ the Good Shephard, Toronto, ON and many others across Canada and the USA.